Especially protected hydraulic tools from Enerpac (A Division of Actuant Corp) are designed for use in extreme environments. The compact but powerful high-pressure (700 bar) hydraulic pumps, cylinders and valves are purpose built for environments such as food and chemical processing, petro-chemical, pulp and paper, mining, construction and welding/high temperature areas. 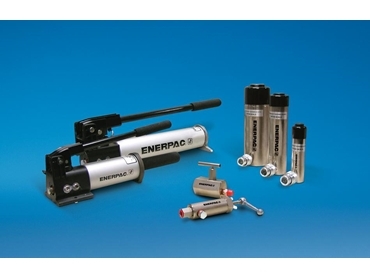 They include nickel-plated steel cylinders with Viton seals, nickel-plated relief and check valves and anodized hand pumps that are compatible with the broader Enerpac range of hydraulic technology, which includes Australasia’s biggest selection of (700 bar) hydraulic cylinders in hundreds of models with capacities from 5-1000 tonnes. RC-V single-acting cylinders in capacities from 5-25 tons, strokes from 54-158mm and weights from 1.5-10kg. The nickel-plated steel cylinders’ Viton seals provide heat and chemical resistance, while their plunger wipers reduce contamination and extend cylinder life. Where higher capacity-to-weight ratios are required, corrosion-resistant RAC aluminium cylinders are available up to 150 tonnes capacity. These feature composite bearings on all moving surfaces to guarantee no metal-to-metal contact, to resist side loads. V66NV manual check valves for additional safety in load holding with cylinders and V-152NV pressure relief valves to limit pressures within hydraulic cylinders over a pre-selected adjustment range of 55 to 700 bar. Two speed hand pumps with a rapidly extending first stage to speed positioning of cylinder plungers, then a more powerful second stage to perform work required in remote or harsh environments. The P-142 ALSS and P-392 ALSS have Viton seals, anodized aluminium pump reservoirs, plastic encapsulated pump bodies and stainless steel pump pistons and inserts that will not corrode or rust. They weigh 2.1kg and 4.1 kg respectively and have internal pressure relief valves for overload protection and handle locks for easy carrying. The larger pump has a second handle, so it is suitable for two hand use.